7.62mm North Korean The TYPE 68 selfloading handgun. manufactured since 1969 by the Military Arsenals of North Korea for service use by their Armed Forces and Police, could be basically described as a a modified TT-33 Tokarev: it feeds the same 7'62x25mm cartridge, from the same 8-rounds magazine. Externally, the differences between the TYPE 68 and a Tokarev are merely cosmetic, but internally, the differences are considerable. The normal link system used to lower and raise the barrel ribs, has been replaced by cheaper and more reliable cams; the magazine catch has been moved to the heel of the grip; the firing pin is retained by a plate instead of a cross pin; and the slide stop has been replaced by a very robust catch instead of the fragile clip of the Tokarev. In fact, the Type 68 is internally more akin to the Browning Hi-Power than the Tokarev. Plus, the TYPE 68 is considerably shorter than a standard TT33, with its 108mm barrel. The TYPE 68 is probably, along with the polish RADOM "Tokarew" and "Sportowy", one of the rarest TOKAREV variants today available on the market. There are very few around, and those are highly collectable: according to a small investigation I made about, here in my country (Italy) there are just two TYPE 68 pistols, all of them in the hand of collectors. The picture hereby attached features two different snapshots of the TYPE 68. 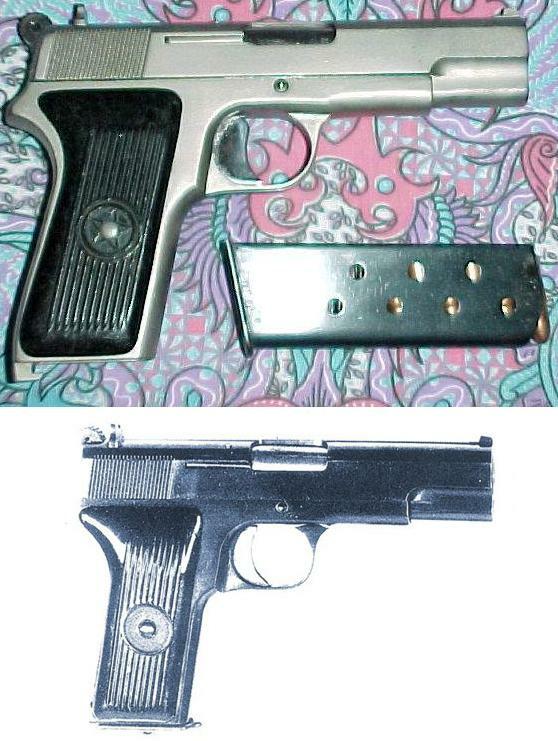 The lower one is a standard service TYPE 68 pistol; the upper one is an highly restored and refurbished exemplar coming from the private collection of a South African gun owner.